I have been on a mission to find the perfect white paint color for my house. I started at the local home improvement store and picked up every shade of white I didn't hate. I came home with about four dozen and taped them all to the wall, eliminating a few everyday. Miraculously my husband and I found one we agreed on and I purchased a sample. I painted a few test squared in different places around our house. I most of the rooms I loved it, but in a few it just didn't work. So I went to a few other paint stores and then I started looking online. I looked on Pinterest. I looked at my favorite blogs. I bought more samples. My youngest daughter thinks the house looks beautiful with all of the squares. She wants me to leave it that way. She just might get her wish. Finally I broke down and asked on Facebook and got some really great answers. Answers from ladies I love who had found a white that they loved too! I then decided that all of the pain of looking for the perfect white paint should at least lead to a great blog post, so I asked a few other ladies online who I think are amazing and the result is this post. Obviously one persons perfect white might now work in the lighting of your house, but these five talented ladies have at least given you a jumping off point so you can find the perfect white paint of your own! Jenn from Tatertots and Jello was the first person to answer my plea for white paint suggestions on Facebook. Her response was Benjamin Moore's Decorators White. She used it on her 1905 cottage remodel. When I asked her about it, she said, "I never thought I would want to paint a entire house white because I love color so much, but this home was so small that I wanted to keep a neutral palette to make it seem bigger. I researched for quite awhile and experimented until I found the perfect white for this home - Decorator White. I painted the whole house this color. And now I want to paint my main home with this white hue too. It really makes the colors POP against the white background." Amy from The Idea Room chimed in after Jen and suggested the same color! "I love Decorator's White because I feel like, with the lighting in my home, it can go with a cool or a warm tone depending on the accent colors I want to use in that particular room. It is not a white that is going to have a yellow or a pink hue to it." After these two ladies suggested it, I went out and immediately bought a sample. Turns out it is IDENTICAL to the color my husband and I agreed on, Gallery White from Behr. I knew that Myquillyn from Nesting Place (aka The Nester) was painting her new house white, so I shot her an email and asked for her perfect white paint color! 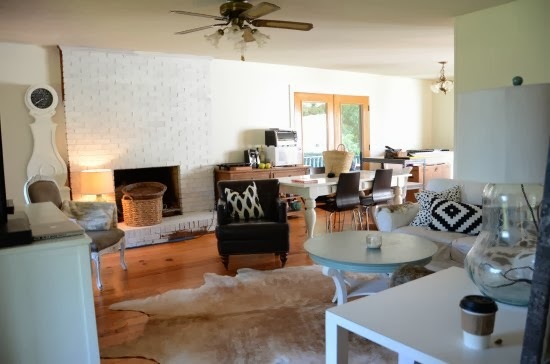 "Whites can be tricky so I followed the advice of another blogger--Trina from A Country Farmhouse used Simply White [Benjamin Moore] in her home and I so trust her judgement. So I used it in our rental and again in this house. It's slightly warm with the tiniest hint of a green undertone which works well if you need to neutralize pinky or orangey hued floors--like I've had. Even our fireplace is Simply White and our trim, I just paint it all the same color (except for the trim on my black framed windows, I wanted those to stand out more)--but normally I used it on walls and trim and baseboards which makes painting super fast and easy." I found Joanna Gaines' blog, The Magnolia Mom, after I saw an episode of her new show Fixer Upper on HGTV. They are renovating an old farmhouse and she was looking for just the right white paint. If plans work out the way I hope they will, I will get to see the farmhouse in person when I head up for the Magnolia Fall Home Show! 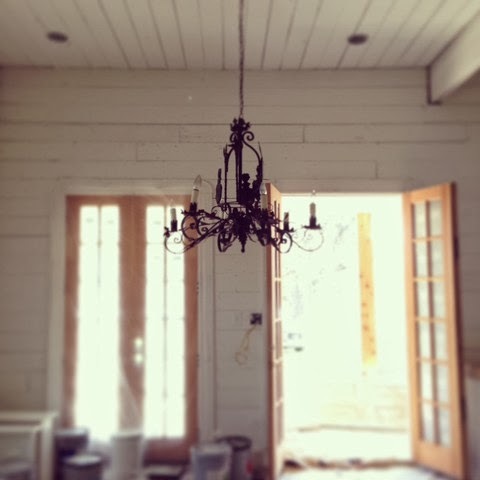 "When we removed the sheetrock on our farmhouse during the renovation, we discovered these amazing shiplap walls. I decided to keep the walls exposed rather than covering them w/new sheetrock. As a woman who typically does color on her walls, I really wanted my farmhouse to feel fresh- light and airy. I chose Sherwin Williams "Alabaster" white because it is a warmer tone white so it softens up the wood on the walls and creates a nice blend for my space." Last but not least, I had to ask one of my favorite DIY Home bloggers, Beth from Home Stories A to Z. She recently painted her kitchen cabinets white, which I also plan to do, so I wanted her input. 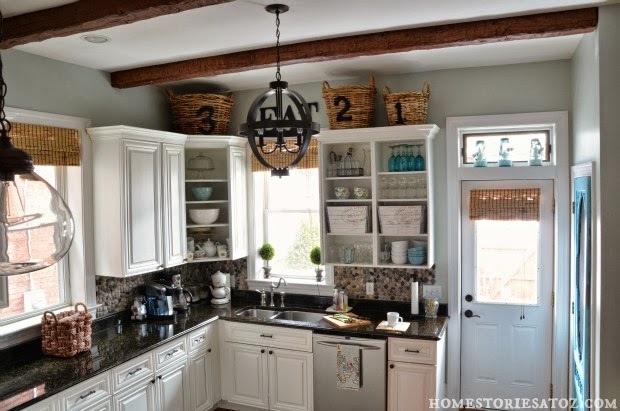 "I used Benjamin Moore's White Dove on my kitchen cabinets and I love how they turned out. 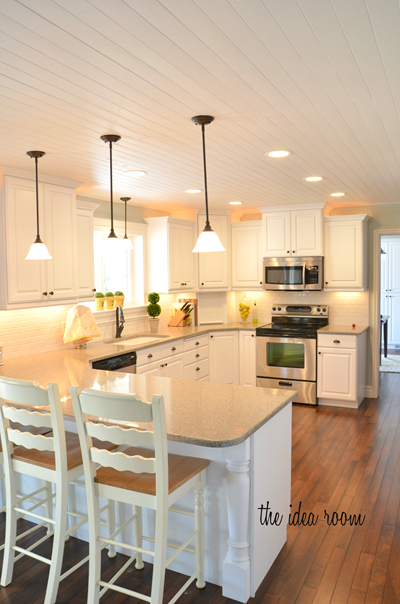 White Dove is the perfect white for cabinets, doors, and trim. It is a clear white that isn't blinding and doesn't carry too much blue or yellow undertones." White Dove was also suggested to me by Beth from Free Stylin' (must be a Beth thing!) and is the next color I will be trying on my walls! I will let you know when I find my perfect white paint color, but if you have already found yours, I would love to hear what it is!! 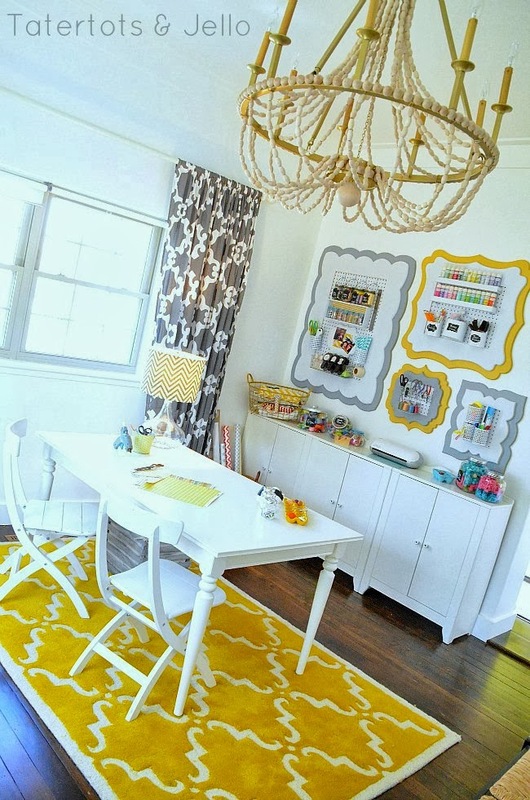 Leave a comment and share a link to your project using white paint! - it's a pure white, which I really needed on my beamed ceiling as light in an old stone cottage can be an issue. - It goes well with any other colour that I want to add. - It's free of chemical and my very allergic skin was grateful I chose that one! By now, the baseboards have also been painted the same white, though it doesn't show on the post I gave you the link to...yet! I loved that you took the time to explain what white other bloggers had chosen and why in your post. It was very interesting. Thanks for this post! I have several horror stories of trying to find a good white. I'll save this post for the future.